The U.S. Food & Drug Administration (FDA) on January 23, 2017 published a proposed smokeless tobacco (ST) regulation (here) that is based on erroneous calculations of ST risks. The agency would require a radical reduction in N-nitrosonornicotine (NNN), a tobacco-specific nitrosamine, in smokeless tobacco (ST) products. Most American ST products today have very low NNN levels: about 2-10 millionths of a gram per gram of product – that is, 2-10 parts per million (ppm), while a limited number of products contain 10-15 ppm (here). The FDA proposes to limit the NNN level in ST products to one ppm or lower. Compared with never users, ST users have an excess risk of mouth and throat cancer (Relative risk, RR = 2.16). ST use causes 276 deaths from mouth and throat cancer in the U.S. each year (this number was rounded to 300 in the proposed rule) – 268 men and 8 women. ST products contain NNN, a human carcinogen that causes mouth and throat cancer. Reducing NNN levels to no more than 1 ppm will reduce the number of deaths by about 115 per year. While the latter two statements are by no means scientific certainties, in this post I will focus on the demonstrably inaccurate first assertion, which is the flawed basis for the FDA’s calculation of “300” deaths due to ST use. The FDA’s use of an RR of 2.16 is in error. The figure, based on a 2008 report (abstract here), combines radically different RRs for men and women. In 2002, I documented (here) that men, who generally use moist snuff (also called dip) or chew, do not have significantly elevated risk for mouth and throat cancer (RR ~ 1). In contrast, women, who primarily use powdered dry snuff, have significantly elevated risk (RR ~ 4-6). My research is in general agreement with risk estimates published last year by the National Institute of Environmental Health Sciences’ Annah Wyss and colleagues at the National Cancer Institute and over a dozen universities and health centers in the U.S. and beyond (abstract here). They determined odds ratios (ORs, interpreted the same as RRs) among snuff and chew users for head and neck cancer – which includes voicebox cancer in addition to mouth and throat, but the risk estimates are applicable. The combined OR among snuff users, men and women combined, was 1.71, which is similar to the FDA estimate. However, the OR among men was 0.86, while the OR among women was 8.89. The ORs for chewing tobacco were not significantly elevated for men or women. I will use the Wyss ORs to show how the application of risks specific to men and women change the FDA estimates. First, the following table (adapted from Table 5 in the FDA’s proposed rule) summarizes the data the FDA used (ST prevalence, RRs and total numbers of deaths from mouth-throat cancer in the U.S.) and the agency’s estimates for deaths attributable to ST (last column). 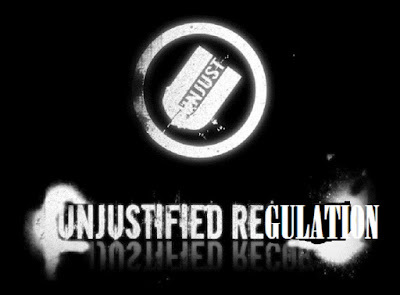 The FDA erred in applying a single RR (2.16) for men and women when, in fact the RR is 0.86 for men and 8.89 for women. Table 1. FDA Estimate of Annual Deaths from Mouth and Throat Cancer Attributable to Smokeless Tobacco (ST), Men and Women in the U.S. In the next table I illustrate how the death estimates change if the specific ORs for men (0.86) and women (8.89) from the Wyss study are used. Table 2. Revised Estimate of Annual Deaths from Mouth and Throat Cancer Attributable to Snuff Use, Men and Women in the U.S.
As noted earlier, my revised estimates are specific to snuff use – powdered dry snuff for women and moist snuff for men. However, the risks for chewing tobacco in the Wyss study are not significantly elevated for men or women, so that product would add zero deaths. In summary, the FDA failed to use RRs specific to men and women, resulting in overestimation of cancer deaths in the former and underestimation in the latter. Using the same FDA formula and assigning the proper risks, I estimate that 52 women using powdered dry snuff die each year from mouth-throat cancer, but the number of deaths among men who use dip or chew is zero. The proposed regulation is therefore unjustified for dip and chew products. The report’s summary conclusions, which are mainly about smoking and not tobacco, follow, with smoke highlighted in red and tobacco highlighted in green. 1. There are about 1.1 billion smokers in the world, and about 4 in 5 smokers live in low- and middle-income countries. Nearly two-thirds of the world’s smokers live in 13 countries. 2. Substantial progress has been made in reducing tobacco smoking in most regions, especially in high-income countries. Overall smoking prevalence is decreasing at the global level, but the total number of smokers worldwide is still not declining, largely due to population growth. Unless stronger action is taken, it is unlikely the world will reach the WHO Member States’ 30% global reduction target by 2025. 3. Globally, more than 80% of the world’s smokers are men. Differences in prevalence between male and female smokers are particularly high in the South-East Asia and Western Pacific Regions and in low- and middle-income countries. 4. Globalization and population migration are contributing to a changing tobacco landscape, and non-traditional products are beginning to emerge within regions and populations where their use had not previously been a concern. 5. 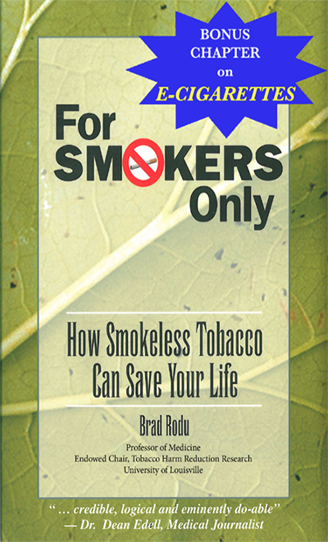 An estimated 25 million youth currently smoke cigarettes. Although cigarette smoking rates are higher among boys than girls, the difference in smoking rates between boys and girls is narrower than that between men and women. Smoking rates among girls approach or even surpass rates among women in all world regions. 6. Worldwide, an estimated 13 million youth and 346 million adults use smokeless tobacco products. The large majority of smokeless tobacco users live in the WHO South-East Asia Region. Smokeless tobacco use may be undercounted globally due to scarcity of data. 7. Secondhand smoke exposure remains a major problem. In most countries, an estimated 15%–50% of the population is exposed to secondhand smoke; in some countries secondhand smoke exposure affects as much as 70% of the population. 8. Annually, around 6 million people die from diseases caused by tobacco use, including about 600,000 from secondhand smoke exposure. The burden of disease from tobacco is increasingly concentrated in low- and middle-income countries. 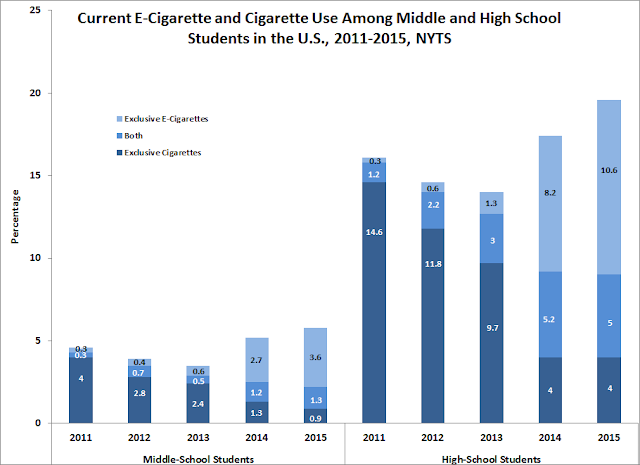 The U.S. Centers for Disease Control and Prevention released selected information from the 2015 National Youth Tobacco Survey in April 2016 (here). The agency cherry-picked numbers from previous surveys to portray e-cigarettes as a threat to teens, while ignoring sharp declines in teen smoking (here, here and here). Last month, the CDC released the underlying 2015 NYTS data, ending an eight-month embargo that prevented analysis by independent investigators. The agency traditionally reports current smoking and vaping numbers separately, ignoring dual use and wrongly suggesting that the numbers are independent. In contrast, here I report exclusive users of these products as well as dual users. I also add important findings that the CDC omitted. The chart shows current use (that is, on one or more days in the past 30) of cigarettes and e-cigarettes among middle and high school students over the four-year period. The CDC emphasized the large increase in e-cig use from 2011 to 2015. As I noted earlier (here), the large spike from 2013 to 2014 was likely due to a change in the NYTS questions. It is clear that the increase slowed during the last year, but prevalence of exclusive e-cig use among high schoolers still increased from 8.2 to 10.6%; dual use declined marginally from 5.2 to 5.0%. The prevalence of exclusive smoking among high school students was flat at 4.0%. Given that the CDC has relentlessly asserted that e-cigarettes are a gateway to smoking, it is unsurprising that the agency did not publicize responses to two questions in the 2015 survey that focused on which products students used first. I report here for the first time how high school students answered these questions, comparing two groups of current smokers: those who only smoked cigarettes and dual users of cigarettes and e-cigs. Percentages in bold: Exclusive smokers significantly different than dual users. The table shows that there were no significant differences between exclusive smokers and dual users in the product first used. Most had tried cigarettes first (60% and 67% respectively); the rest had chosen cigars, smokeless, e-cigs and other products. There is little evidence here for the CDC’s claim that e-cigarettes are a gateway to smoking. This table shows that large majorities of high school current exclusive smokers and dual users started with cigarettes. Only 15-16% of these students are even eligible to be considered gateway cases, in which users moved from vaping to smoking. There are troubling inconsistencies in these tables. For example, 16% of current exclusive smokers – who only used cigarettes in the past 30 days – responded that they never tried cigarettes (Table 2). Four percent of exclusive smokers responded that they had never used any tobacco product (Table 1). The “Y” in NYTS stands for youth, and responses from these surveys are known to be inconsistent. In working with the data, if one eliminates participants who gave inconsistent responses, there would be considerably fewer valid participants. I discussed this problem in 2015 (here), when I called on the CDC to “issue a comprehensive report on the internal consistency and relative validity of the NYTS data.” The agency appears to have ignored that issue.